MKDA designs full-floor expansion space for Stone Harbor at 31 West 52nd St.
MKDA has completed a full-floor expansion space for global institutional fixed-income investment management firm Stone Harbor Investment Partners at 31 West 52nd St., where MKDA has been engaged several times over a decade for various restacking and reconfiguration projects. 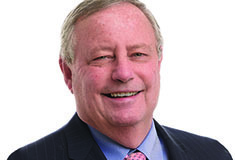 "We are proud to count Stone Harbor as one of our long-term clients," said MKDA president Michael Kleinberg, who noted that the firm has 52,000 s/f overall at its Midtown corporate headquarters. The 28,000 s/f floor features a large, central open trading area with 113 height adjustable trading desks, a beverage bar, sizable LED ticker display and a special pitched ceiling design that creates an architectural feature and optimal airflow and comfort for the traders. 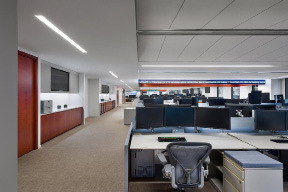 The ceiling and HVAC system installed above each double row of trading desks combine linear diffusers and return air slots to force cool, comfortable air down behind traders. The cool air is pulled through the desk and then up with the warm air generated by the trader and computer equipment through a chimney that runs along the spine of the desk. It is released into the plenum at the top of the ceiling. A thermostat at each row of trading desks regulates air comfort. 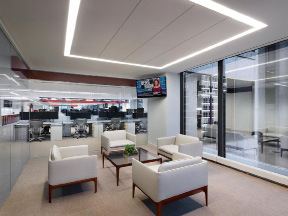 "The resulting airflow provides considerable comfort for the traders and the pitched ceiling produces a dramatic architectural feature within the space," said MKDA executive vice president and director of design Daniel DeSiena. "The intricate assembly of the ceiling required rigorous mechanical design," said MKDA executive vice president and project manager John Giuseffi. "Through collaboration and coordination with the mechanical engineers and the carpenter we were able to achieve the aesthetic without sacrificing function." In addition to the large open trading area, the space features 20 double office, four single offices, four conference rooms with banquet seating, multiple pantries, a ticker and a wood, metal and glass staircase that joins the expansion space with the investment firm's existing floor. The warm, traditional space was designed to match the previous aesthetic that MKDA devised for Stone Harbor and includes a neutral color palette with wood and glass office fronts and cherry wood private office furniture. LED lighting was used throughout. MKDA is a space planning and interior design firm that was established in 1959 by showroom designer Milo Kleinberg. The firm is headquartered in New York, NY with additional office locations in Stamford, CT and Miami, FL. MKDA serves local and global corporations, non-profits, government agencies, and commercial building owners in key markets throughout the U.S. Clients include have included Guggenheim Partners, Centerview Partners, CVC Capital Partners, Duval and Stachenfeld, Fab.com, Brown Shoe, Makerbot, Design Within Reach and Heineken USA. The firm is one of the most prolific interiors firms for landlords, servicing esteemed building owners Silverstein Properties, Vornado Realty Trust, Blackstone, Boston Properties and Normandy, to name a few.